I got the paper about PSP (Partial Solubility Parameter) by prof. Costas Panayiotou. 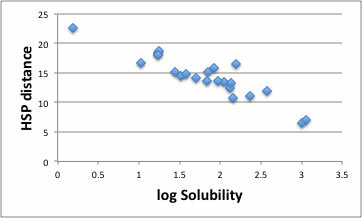 He claimed that PSP can predict solubility of drugs more accurate compare to Hansen Solubility Parameters (HSP). So I try to check our algorithm with same data. In the paper, they set the sphere limit as 100ｇ/1kg Solvent. Then the result of HSP (center column) is very bad (14/24) compare to their method. From HSPiP ver. 3.1.x, we have new algorithm to fit real solubility data to the Sphere. Classic Sphere, it is qualitative analysis and treat the data inside=1, outside=0. 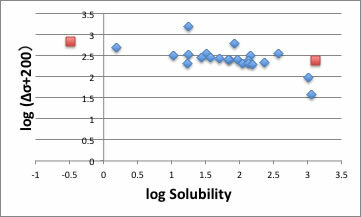 The solvent near the Sphere center does not always largest solubility. With new algorithm, program will find the sphere center so as the larger solubility quantity, the nearer sphere center. You will find this function at GA option. 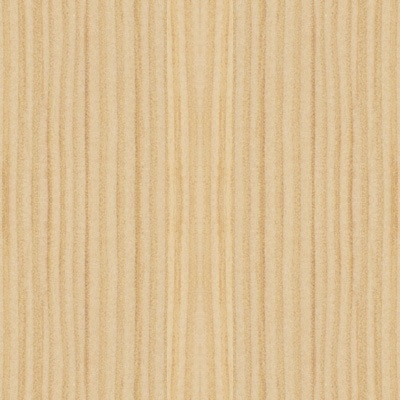 The result become like below. The sphere limit is 100ｇ/1kg, that means 2 with log plot. When HSP distance become longer than 11, it become out side the sphere. So upper right or below left part of red cross are exceptions. That number are just 3 so same level with PSP method. Let’s examine more detail. The rightest data, diethyl Amine and the leftest data dichloromethane are so bad data so eliminate from data set and search Sphere again. 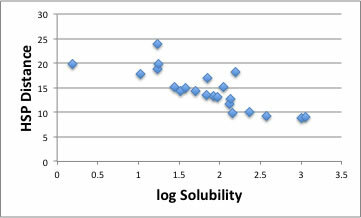 Then the correlation between HSP distance and log Solubility improved so much as show above chart. Prof. Panayiotou introduced Hydrogen bonding Donor and Acceptor terms as show below scheme. Form ver. 3.1.x, HSPiP also have the Hydrogen bonding Donor and Acceptor terms. If I apply dHdo/dHac to quantitative analysis, the result improved so much as show below chart. 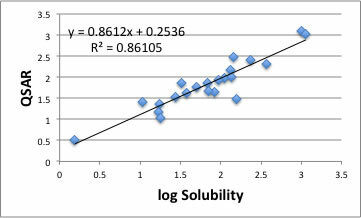 With this result, the max log(solubility) would become 3.5 to 4 at the HSP distance equal 0 (4D HSP[18.0, 16.3, 7.6, 16.3]). If you are using HTML5 enable browser, 4D Solvent Designer program will run. Please set HSP and click Search button, select all the result and copy. Paste the result into Spread Sheet, then sort with Distance column. The best solvents mixture is DMSO:Ethanol=50v:50v. 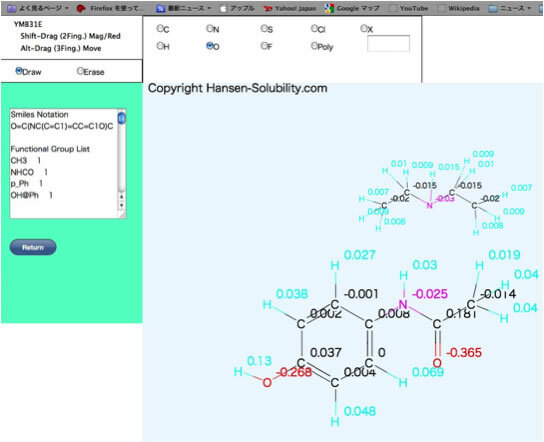 This program include Q3C rank 3,4 + solvents. I also plot the result of Prof. Panayiotou. The result is not so good compare to HSP result. I made QSAR scheme HSP distance with molecular volume. The worst solvent is THF. The THF is hydrophobic solvent though it dissolve into water 100%. Very problematic solvent. If we eliminate 2 solvents, the result become so beautiful. Why HSP model can not handle these 2 solvents? Actually, diethyl Amine type of functional groups are so common in the body. When think about Paracetamol solubility to such parts, HSP distance is very long even though Paracetamol easily dissolve into such parts with unknown force. We HSPiP Team have not found the force yet but with using QEQ charge calculation or other techniques we are trying to catch. The reason we use to QSAR, it is not to get high correlation factor, but we want to know exceptions. That will lead to find new force or new rule that account for activity of drugs. The quantitative analysis with dHdo/dHac function is not implemented into HSPiP ver. 3.1.x.. I distributed only limited users who agree to feed back the results. After complete the function, it will implement to HSPiP. YMB33E is also same situation. The large sphere means Paracetamol. 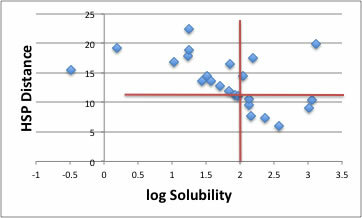 The solvents show with sphere means large solubility solvents. 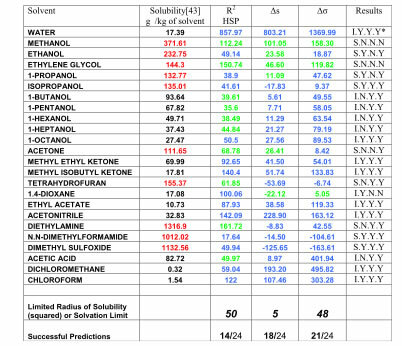 The cubic solvents means smaller solubility solvents. The color means dH donor(RED) or acceptor(BLUE).